rachael ( bella's mom) has a good eye for a photo...-- there is anotehr priceless shot of george standing 6' talkl against a fence, and one eye of bella's struggles to see over the fence.. it is bella and george's facebook page. zena tossed her cookies first thing this morning-- well actually it wasn't her cookies... it was the yellow slime which i am told is bile- this happens to danes on anb empty tummy... a quick treat or two first thing...and they don't seem to do it. if you look back at alot of the sdp group photo's most have everyone in his hats. kieth- who has hudson- one of our dogs--- we were invited to his wedding and apparently it is the custom in argentinia ( his parents background) for wedding parties to all wear hats..
they ahd a tablefull of hats-- and i noticed once anyone put on a hat- they became silly... better than 2 drinks- silly.. When asked how Elsie was doing Jeanine said she is so happy with this pup, she is fabulous. She says the best thing is that she no longer has to rely and/or wait for people to take her places and Elsie has given her, her independence back! Elsie is PERFECT in restaurants, as long as she has her blanket to lie on. People are amazed when they get up to leave and cannot believe that, that big dog was there the whole time. Elsie did beautifully on her first plane trip. People sitting with them wanted to take pictures to show people who they got to sit near on the plane. Elsie is completely devoted to Jeanine and even if she is happily playing with her grandson, if Jeanine gets up, Elsie immediately comes to her side, to the dismay of her grandson. She stayed right next to me, looked at me as if to say, "Now, what did ya do THAT for"..LOL..I was laughing given the look on her face..I didn't even have to tell her to "Stay" (as Brace isn't HER word) ;) and she stood by me so I could grab her harness under her coat..She stood like a rock :D I got back up and she checked me over and went about her business..
She amazes me daily.. :D I LOVE my girl!! the house recieved another significnant gash when i slid sideways going around the nuthouse corner.. it is not the first gash-- learning to go around with the old ambulance put a few more in the logs..
thank heavens it is a log house where "dents" would just be termed ' distressed' and make it more valuable. if it was normal siding the tractor would have landed in my bedroom. this poor house--- the fact that the front porch is at an odd angle having pulled 3" away from the roof due to mary's quest for carrots. The lopsided porch is just a fond memory of a braying 750 pound donkey stuck on the front porch. i am pleased they have decided no rain sunday --- that could really gum up the works around here.. it is a shatupon sunday--- david did clear the snow from the flat area- creative parking will be in effect. w/r/t all these invitations i get to "join"someone or somthing... i do not know how to link,book faces or twit and since i got to be this old without it. i see no reason ( as yet) to twit-- i prefer the age old way of passing messages to tv reporters-- you just yell at the screen.... i am sure it is as effective as twitting. and then there is the requests to "join shutterfly" emails--- i don't think you have to.. i don't think i belong and i look at the pictures all the time.. i think you have to be "special" if you want to change the pictures--and that is not me either... mark does a spectacular job of all that..
i could start mentioning people who do a spectular job at stuff-- mark certainly being one of them-- along with being camera mark, he seems to focus on a job needing attention and he just tackles it-- he has a memory and a half--- and he has learned --finally-- not to start any conversation with me with "don't you remember...?"... no i don't. bud and annie get more things done than anyone else in the project...and they do them slower than any one else. and grace--among her many jobs-- she cooks a great meatloaf. where would we be without her laundry management.?? we should have .. be kind to theresa day-- the brunt of this accreditation paperwork has fallen to her to get it all together in some loose leaf notebooks. megan went to battle with a nasty woman at the doctor's office yesterday. lynn has left everyone with the ammunition for battle. the first stage irate "i am alergic to dogs" got met with "i am sorry to hear that"
"well take that dog out of here" got a "no"
JUST THOUGHT YOU MAY ENJOY A FEW MINUTES OF THE TRAINING THAT WENT ON WITH THE CLYDESDALES FOR SOME OF THE SUPER BOWL COMMERCIALS. YOU'VE PROBABLY DONE MANY OF THESE THINGS YOURSELF. IT WAS JUST SO ENJOYABLE TO WATCH THEM IN ACTION AND THEIR GREAT RELATIONSHIP WITH THE TRAINERS. My plan will be to update daily with The Adventures of Bella and George! Today was another day with no school. They were able to relax after a busy day yesterday but then tonight we went to get some dinner and after that they decided to go outside and play in the snow. We try to make sure Bella and George go out at least once a day with his vest on even if it's a quick trip. Of course when Bella was on the sled there was a lot more giggling and George chasing her down. The videos didn't come out as good since it was dark out. Hopefully I picked the right video. Even if it's dark you can hear the giggles of joy! Thanks everyone for loving and supporting Bella and George! I can't tell you how much it means to us. Tomorrow we battle school with Megan. I will let you know how it goes. On Monday a group of my colleagues from the MS Society and I went to the Virginia State Capitol. We spent about three hours there and met with two senators and three delegates and encouraged them to vote yes on several bills that would make life easier for those living with MS. I lost count of how many people took his picture, commented on how well behaved he was, and asked the usual questions. He brought a lot of attention to our cause, all of it good! MORE SNOW? IT IS A BAD THING TO WAQKE UP TO MY "WEATHER CHANNEL WITH NO SOUND" AND SEE RED WITH BLURRY WORDS.... I CAN'T FIND MY GLASSES FOR THE FIRST 20 MINUTES OF CONSCIOUS BEHAVIOR-- AND THEN I SEE THE INDIVIDUAL LISTINGS FRIDAY NIGHT 2"--( BIG DEAL?? !!) SAT MORNING 2" SAT AFTERNOON 3" , SAT NIGHT 2" AND THEN .. THE BIGGIE SUNDAY MORNING Rain..
now if you consider all my nutty professor stuff with the siphon hoses... "water seeks it's own level" i.e. a very flat surface frozen smacks of a skating rink--- for cars??? laura's school got called off again-- apparently the sidewalks in hamilton are not yet plowed---i had to ask.... how many kids now walk to school?? and she said.. in hamilton you get to ride the bus if you live over 2 miles from school.. i am of the generation that walked 12 miles to school every day -- in the rain , sleet and snow... UP HILL BOTH WAYS. the difference now adays is these kids are saddled with a pack of books that weigh twice what they weigh.. i think they weigh kids down with them to expend some of the energy that new england kids in the 1700's spent rolling rocks into stone walls. every school in new england should have a 3' high stone wall surrounding it...all done by students. How much trouble could a kid get into . trying to throw 100 pound boulders around. a few pinched /blue and broken fingers-- sorry-- be more careful...no sympathy.-- put 2 stakes in the ground and when you are done you are done. back in the 1700's i am sure there was no emergency room with a sympathetic nurse and ice packs for a pinched finger. rolling one rock toward another you would learn about things like mass and momentum. meanwhile scarlott who was vomiting 2 days ago was fine yesterday, happily eating peeing pooping-- that is called fine. I posted the following on FaceBook and I wanted you to see it as well. It happened on Monday while preparing for the storm so of course, the store was crazy. I have since spoken with ACO and the store. Our ACO is fantastic and if I can find out who the woman is they will go speak to her. The store has not been as responsive as I’d like but I’m going to give them another day and then go in there and see if a “face to face” doesn’t result in a more “effusive” response. And yes, Willow is fine thank god! First, the fact that your dog DRAGGED you across the store to get to her CLEARLY demonstrated you DID NOT have control of your dog. It also clearly demonstrated that YOUR DOG WAS/IS NOT TRAINED and has NO business being in PUBLIC! Second, it is ILLEGAL to interfere with the work of a Service Dog AND to INJURE a Service Dog comes with stiff penalties and liabilities. You would also be liable for the injury to ME!! The final INSULT was your total obnoxious response to my screaming "control your dog" "stop" and finally, "that fu*#^ing dog DOES NOT BELONG IN PUBLIC!" Your response? "She's fine, I take her everywhere." NO, she IS NOT FINE! When a dog drags it's owner across a store, teeth bared, growling and barking toward a Service Dog and it's Handler, THAT IS NOT FINE! The only thing that prevented disaster was I saw it coming, I was braced on the carts, Willow is exceptionally trained and I have 30 + years training dogs and knew what to do. And even with all of that, I was scared to death and left shaking like a leaf. You ma'am, need a reality check. And consider yourself placed on notice. If I see you and your dog in public again, I am calling ACO and reporting you and the dog as a dangerous animal. BAD CONCEPTS?? I CAN HEAR JANINE SCREAMING AND THERE IS NO HEATER... PROBLEM WITH FATSO OUT THERE IS IF MADDY AND JAQNINE CAN'T RIDE HIM, I WOULDN'T EVEN DARE TRY-- I NO LONGER BOUNCE WHEN I FALL OFF--NEITHER DOES JANINE. I WOULD NEED A HORSE LIKE GRANT-- WHO WAS THE "GOLDRUSH III " FOR REX TRAILER--- ABSOLUTELY PARADE/ CROWD BOMBPROOF.. WE NAMED HIM GRANT AFTER THE SPLIT PERSONALITY OF GRANT ON GENERAL HOSPITAL BECAUSE THE ONE THING HE DID WHEN LOOSE, WAS BITE... NOT A SIMPLE NIBBLE- BUT A SERIOUS CHOMP.-- KNOWING THAT , YOU JUST HAD TO GET HOLD OF HIS HEAD QUICKLY- THE REST OF HIS BEHAVIOR WAS PERFECDT-- AND HE WAS COMFORTABLE. REX USED HIM FOR YEARS ON TV AND PARADES. ANOTHER STORY ABOUT HARVEY-- I BOUGHT HIM FOR 40 CENTS A POUND- HE WAS ON HIS WAY TO THE KILLERS BECAUSE HE KICKED SO BADLY...... I WAS NEVER INTO THE RACING BIT EVEN THO I DID GET MY TRAINERS LICENCE TO TRY AND SAVE MONEY- ---I ONCE HAD HIM AT SUFFOCK DOWNS AS OUR LEAD PONY WHEN EXERCISING ONE OF MY HUSBAND'S "RACE" HORSES. AT ONE POINT TOM BOUGHT A 3 YEAR OLD FOR ALOT OF MONEY- WE WOULD TRAILER IT TO SUFFOCK FOR EXERCISE-- WITH HARVEY... AND NO ONE WAS AT ALL INTERESTED IN THIS EXPENSIVE HORSE, BUT I HAD SEVERAL OFFERS TO BUY HARVEY BEFORE WE EVEN GOT AROUND THE TRACK ONCE. HE WAS A SOLID HORSE. IF YOU TAKE THE "RACING FORM" (WHICH GIVES STATS ON EVERY HORSE RACING THAT DAY IN THE US...) AND CONSIDER ONLY 2 NUMBERS-- THE AGE OF THE HORSE- THE TOTAL LIFETIME WINNINGS--- I FOUND THAT OVER 90% HAD NOT EVEN WON ENOUGH MONEY TO PAY THE JUST THE HAY BILL TO GET THEM TO THAT AGE. THAT IS JUST THE HAY... NO GRAIN, BLACKSMITH, TRUCKING, TRAINER,JOCKEY,HOT WALKIER, VETERNARIAN. COUPLE OTHER THINGS - IF NO ONE CARRIED A WHIP, ONE WOULD RUN FASTER THAN THE OTHERS AND BE THE WINNER-- SO WHY WHIP??? AND THEN-- ALL THE PEOPLE WHO COMPLAIN ABOUT THE CARRIAGE HORSES--- THOSE GET TIME OFF, VACATION TIME, SUPER VET CARE, ( NO ICING OF PAINFUL LEGS HERE) THEY ARE FORCED TO RETIRE AT 23 YEARS OLD-- MOST RACE HORSES ARE DEAD BEFORE THEY ARE 6 YEARS OLD- I THINK I SAW ONE ONCE THAT WAS 10 YEARS OLD.. EVER SEEN A HORSE STANDING EATING HAY WHILE HIS FRONT LEGS ARE IN A TRASH CAN FULL OF ICE WATER SO THEY ARE SO NUMB HE CAN RACE AND NOT FEEL ANY PAIN?? COMMON PRACTICE IN RACING... "WE HAD TO ICE HIM" I HEARD IT MANY TIMES. I HAVE NEVER SEEN A CARRIAGE HORSE "ICED"-- AND THEY ARE HAPPILY DOING A JOB AT 20 YEARS OLD- FORCED TO RETIRE AT 23- AND MY GUESS IS THEY WOULD PREFER TO WORK. AFTER MEGAN GOT BACK FROM HER SCHOOL TRIP WITH BELLA, SHE MADE A COMMENT ABOUT HER CONVERSATION WITH THE PRINCIPAL WHICH MADE ME SIT UP AND TAKE NOTICE. COULD BE THAT THE PRINCIPAL IS MAKING JUDGEMENTS ABOUT TRAINING WHICH ARE BASED MORE ON THE OBEDIENCE TRAINING LEVEL THAN OUR SERVICE DOGS. THE OBEDIENCE TRAINED DOG SNAPS TO ATTENTION AND DOES FOLLOW SPECIFIC COMMANDS- TO SOME DEGREE BLINDLY.. HEEL SIT STAY DOWN COME.- THEY DO IT AND THEIR MIND IS TOTALLY EMPTY UNTIL YOU GIVE THE NEXT "COMMAND". OUR DOGS ARE DIFFERENT... OURS HAVE TO THINK. JUST AS SEEING EYE DOGS ARE ALLOWED TO MAKE DECISIONS ABOUT GOING AROUND BARRIERS ETC--- THERE IS INTELLIGENT DISOBEDIENCE..
AN EXAMPLE OF GEORGE WORKING PERFECTLY IS TO WATCH HIM WALK DOWN THE HALL PAST THE NURSES STATION.. WHEN HE WAS IN THERE WITH BELLA , SHE WAS IN MELTDOWN- AND CRYING. SO WHEN GEORGE WALKS BY THAT DOOR, HE VEERS AWAY FROM IT.. HIS LOGIC IS " LAST TIME WE WERE IN THERE MY PARTNER WAS UNHAPPY, SO LETS STAY AWAY FROM THAT PLACE." IF SOMEONE DID NOT UNDERSTAND THAT THEY COULD ASSUME GEORGE WAS DISOBEDIENT AND CAN'T WALK A STRAIGHT LINE. PILE A COUPLE OF THOSE REACTIONS ON EACH OTHER AND YOU COULD CONCLUDE THERE WAS A PROBLEM -- WHEN IN FACT HE IS WORKING WELL --- HE MAY NEED SOME HELP TO UNDERSTAND SOME SCHOOL CONCEPTS BUT HE IS WORKING FINE. YOU MAY HAVE "ALL THESE KIDS COME RUNNING INTO TH E HALL WHICH MEANS BELLA AND I CAN GO HOME " SO IF KIDS COME RUNNING INTO THE HALL FOR RECESS . HE MIGHT THINK - "TIME TO GO HOME." .. JUST A DETAIL TO WORK OUT. THERE ARE NO "COMMANDS" FOR THESE SITUATIONS - AND JUST TALKING TO HIM AS YOU WOUL D A TWO YEAR OLD CHILD IS USUALLY WHAT IS REQUIRED... SOMETIMES BELLA NEEDS TO BE REMINDED TO TALK TO HIM.. HE IS TRYING TO UNDERSTAND -- GO TO ROOM 1 COMFY MAT-- TAKE A NAP... GET UP GO TO THE BIG ROOM AND WATCH BELLA CHASE BALLS... GOTO ROOM 2 -- COMFY MAT TAKE NAP-- GO TO CAFETERIA-- COMFY MAT- WATCH BELLA EAT - GO TO ROOM 1 COMFY MAT SLEEP -- EVERYBODY RUN IN THE HALL-- GO HOME AND PLAY. NOW IF YOU ASK HIM TO LIE DOWN ON A HARD /COLD FLOOR, YOU MIGHT GET " WHAT ARE YOU NUTS??? NO FLUFFLY?? I'D RATHER JUST STAND"-- YOU COULD FORCE THE ISSUE AND ISSUE A DEMAND !!! ---BUT USUALLY THERE IS NO PROBLEM IN HIS STANDING INSTEAD OF LYING DOWN..
OUR DOGS ARE NOT TRAINED TO SIT. IF YOU ARE USING THEM FOR BALANCE -SITTING IS COUNTERPRODUCTIVE... SO WE DISCOURAGE SITTING. WHAT WE DO NOT WANT TO HAVE HAPPEN IS FOR GEORGE TO DECIDE "BELLA IS TOO UNHAPPY IN SCHOOL - SO LETS JUST NOT GO THERE." IF ANYTHING EXCITING HAPPENS I WILL POST A PARTIAL DOGGIE. plus----locate the shovels before they get burried and require memory to locate. we should be fine unless these 100 ' tall trees start falling on us-- that could get exciting. and another big problem--- we no longer have MARY--- she used to break down a path in the deep snow..for the dogs to run in a loop up over puppy hill and the flat field... janine reports that the 3 fatso's that are getting too much hay will probably be useless..rumor has it the draft pony is not quite broken-- or else he is too opinionated to stear- we can put maddy up on him and push him into the flat field-- with 2 feet of snow, he would come back better behaved-- and if he throws her off , the landing would be soft. i have written a letter to the superintendant of schools-- i just sent it to our board for approval just to make sure i did not sayu anything i should not have said... there was alot i wanted to say--- and all of that could have been said in 25 words or less... but i would have owed about $23 to the swear bear. someone sent me a Words of wisdom thing about people who swear are more reliable than those who don't. must be true-- it was on the internet. I USE THE WEATHER CHANNEL WITHOUT SOUND AS MY NIGHT LIGHT-- SO THIS MORNING I WOKE UP TO A BUNCH OF RED ON IT...THAT MEANS TROUBLE.... AND BY THE TIME I FOUND MY GLASSES IT WAS USING THE ZZZZZ WORD WITH 18 TO 24 INCHES OF SNOW... WHICH WE CAN MANAGE-- THE PART THAT BECOMES A REAL CHALLANGE IS THE WORD "BLOWING" NOW THAT IS A DIFFERENT STORY--- THAT CAN BE 6' DRIFTS EXACTLY WHERE WE DON'T NEED THEM-- AND WHERE THE TRACTOR CAN NOT REACH-- 6 FOOT DRIFT IN FRONT OF THE DOOR ISW NO PROBLEM-- I WILL GET THERE EVENTUALLY WITH THE BUCKET... NOW PILE THAT 6 FOOT IN AMONG THE CHAIN LINK AND WE HAVE A WHOLE NEW PROBLEM. STEVE HAD THE SNOW BLOWER GOING GREAT GUNS YESTERDAY WITH OUR MEASLY 6"--- IT IS A BIG SNOWBLOWER- BUT IS NO MATCH FOR MOMMY NATURES ABILITY TOP BLOW SNOW .... I Have SEEN DRIFTS SO TALL THAT THE SNOWBLOWER COULD CARVE A TUNNEL THRU AND OUT THE OTHER SIDE.... IF ONLY YOU COULD DIRECT THE BLOWING PART. SOOOOOO... I AM ENCOURAGING THE PP's (PHYSICALLY PHIT) TO CONSIDER HAVING A SLUMBER PARTY OVERNIGHT MONDAY NIGHT.. MY USUAL PLAN IS TO GET OUT AND PLOW EVERY 4-6 INCHES AND TRTY AND KEEP US OPEN FROM STREET TO BARN--- BUT THAT DOES NOT INCLUDE PARKING IN THE MIDDLE OF THE STORM--- IT WORKS BETTER IF PEOPLE AR PARKED AHEAD OF TIME-- AND WE GET THRU THE EMERGENCY PART-- THEN I CAN DIG OUT ANY CAR THAT NEEDS TO BE DUG-- ESPECIALLY IF YOU BACK IN.... THAT WILL AVOID 3 POINT TURNING IN PILES OF SNOW. AND I HAVE TO CONFESS-- THE TRACTOR CAB IS SO HEATED I HAVE BEEN KNOWN TO REMOVE AN OUTER LAYER...-- AND WITH THE BACKHOE STILL ON IT, IT IS TOUGH TO GET IT STUCK... I COULD.... BUT USUALLY I CAN PICK UP THE WHOLE TRACTOR WITH THE BACKHOE-- AND MOVE IT AROUND ENOUGH TO GET OUT OF THE MESSES I CAN GET INTO.. I REALLY NEED SOMEONE HERE TO KEEP THEIR EYE ON ME IN CASE I HAVE ANY TRACTOR PROBLEMS... IT IS IMPOSSIBLE FOR ME TO WALK TO THE HOUSE / BARN IN A FOOT OF SNOW-- I AM SO USED TO OLD MACHINERY BREAKING DOWN THAT I AM SCARED... THIS TRACOTR IS NEW LAST YEAR - AND SHOULD BE FINE... BUT MURPHY'S LAW IS MURPHY'S LAW... AND I NEED PEOPLE HERE BEFORE I EVEN GO OUT..
AND THEN THERE IS TRACI (ADAMS) DUE TO FLY OUT TUESDAY NOON--- THAT JUST AIN'T GONNA HAPPEN UNLES THE FORCASTERS ARE ALL WRONG.-- BESIDES -- WE CAN'T PART WITH HER JUST NOW. SO I DON'T KNOW THE RESOLUTOIN OF THAT. THEN... THE BELLA/GEORGE PROJECT.... MEGAN IS PLANNING TO GO TO SCHOOL WITH THEM ON MONDAY-- AND IT LOOKS LIKE SHE CAN GET THERE AND COME HERE BEFORE IT GETS TOO BAD.. YOU ONLY NEED ONE TRACTOR TRAILER SLIDING AROUND 128 TO REALLY GUM UP THE WORKS... I WAS DELIGHTED TO SEE THE VIDEO OF GEORGE AND BELLA OUT PLAYING IN THE SNOW... I STILL DON'T KNOW WHAT HAPPENED TO HAVE TH E PRINCIPAL ASK BELLA'S MOTHER TO COME GET GEORGE. NOT BEHAVING? HE DOESN'T SIT - NONE OF THE BALANCE DOGS DO--- AND IF YOU ASK HIM TO LIE DOWN ON A COLD FLOOR-- HE MIGHT SAY NO AND JUST STAND THERE.. NOW START PUTTING PRESSURE ON BELLA AND ANYTHING COULD HAVE HAPPENED. I CAN SEE IN GEORGE'S HEAD " IF YOU ARE MISERABLE GOING TO THAT BUILDING, THEN JUST SIMPLY LETS GO TO ANOTHER"
THE WORDS "HOSTILE ENVIRONMENT" COME TO MIND. I FELT IT- AND I AM OLD ENOUGH TO DEAL... A KID WOULD NOT BE SO HARDENED. FACT #2 EARLY SANDY IS RELATED TO EVERYONE IN WOBURN.. SO BACK TO THE BLIZZARD-- PEOPLE ARE BEGINNING TO RESPOND TO PAM'S REQUEST FOR HELP ON MONDAY NIGHT .. WHICH WILL PROBABLY BE TUESDAY NIGHT ALSO-- DEPENDING ON TIMING..
WE CAN USE UP ALL THE FOOD IN THE FREEZER. WE ARE WONDERING HOW LONG MAIL TAKES- AND IF IT TAKES 7 DAYS CROSS COUNTRY,, WHAT DOES THE POST OFFICE DO WITH THE BACKUP AND WOULDN'T IT BE CHEAPER TO MOVE IT OUT QUICKER?? SO IF YOU ARE MAILING STUFF HERE, WOULD YOU PLEASE PUT YOUT MAILING DATE ON THE BACK OF THE ENVELOPE.. I KNOW WE HAVE SOME CP'S IN BENNINGTON... ANYONE REMEMBER THAT CASE?? LIKE ? 2003 MAYBE??? THank YOU-- MAKES IT EASY FOR ME TO CHECK--DOGS HAVE A CODE-- YOU DON'T MAKE THE OTHER DOG YELP WHEN YOU ARE PLAYING BECAUSE WHENB THEY YELP THEY QUIT OLAYING AND THE GAMNE IS OVER...-- AND THE BITTEEE HOVERS AND SNAPS AT THE BITTOR.. KIARA IS STILL IN NORMAL ATTACK MODE-- I SEE NO SCARED HOVER... SO I PASS ON THIS ONE... LOOKS NORMAL. I HAVE HEARD ABOUT ONE SERIOUS SNAP OVER A KONG... SO WE TOOK THEM OUT... YOU CAN NOT GIVE ONE TO EACH-- THE DOMINANT GETS BOTH. Priya has changed my life! Once I put her vest on, she's all business and does not waiver. She immediatly senses when I might need her and has stopped me from falling so many times. Recently I started to slide down a gravel hill and she threw herself right in front of me to stop me. She is unbelievable. Even at home, when she is not in Service Dog mode, she comes running if she ever sees me stumble or fall. Priya is so well behaved and quiet. When we go out to dinner, she sits under the table and doesn't move or make a sound. Often, when we get up to leave, people are shocked to see her becuase they had no idea she was there. It's a big surprise because she is just so good, and so quiEt. 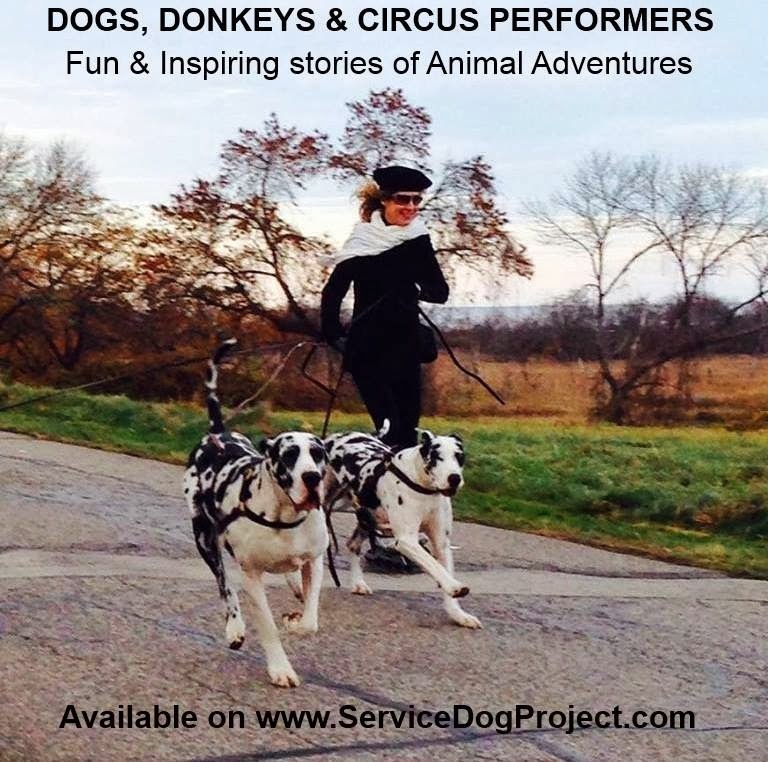 in my opinion, if enough pressure is put on a person with any service dog, and they get nervous, these danes are so sensitive that the relationship will suffer- and when that does the behavior will suffer.... and we all know if a service dog is not behaving they can be thrown out. i would be inclined to call that forcing a failure. snide remarks are bullying in my book-- but... our concern is the dog--- and we want the best for the dogs we put in service. with that in mind i do not know what the solution is.... actually i have not heard the latest report either. i had a very delightful conversation with an applicant yesterday -- she had a speech impediment- and i am nearly deaf-- so we decided to resort to emails. she may be coming here next week sometime... i couldn't really hear what she said. kati has come up with a friend in iowa ( kati is from there) who bred her harl dane to a merle stud they got from europe- and got all black and merle pups-- which in the normal great dane world have little value--- so i have asked for photo's of the parents- and see if maybe some of those pups might fill the gap we are going to have--- i am afraid opal is -- again -- a lost cause. in the process of cellar cleaning, and burning all tom's old medical records, we discovered a file of many years of animal episode jobs... those have been sealed and await orgainzaton... i did see one job for the vermont lottery 3 donkeys s llama and some sheep -- in a studio in boston--- $2000. there are some really good ones.... the emerson theater ---a 2000 pound draft horse waiting back stage deciding to pee and the only thing big enough to begin to hold the gallons he produced was my new llbean down jacket.--- the $90 parking ticket for parking in 3 parking places with my big 53' horse trailer. there are alot of stories there. megan is picking me up in 1/2 hour to go to bella's school--she is having a problem with her attendent. who does not seem to "get it" that t the dog is to replace her crutches and walker... .. she still needs help wioth doors and carrying trays etc.. this " you are supposed to be independent now so do it yourself" has caused several near miss accidents where bella - TRYING TO be independent is getting set up..
"i'm alergic- i hate dogs--" "i used a whole box of kleenex today"
donna is going with megan and me-- she knows alot about 504 plans and parent approval stuff... there are sooo many exact quotes from hunters situation including a complaint that a process used to take a minute - and now takes 3 minutes..... so who's counting?????. it is most pequiliar for sure-- except bella is walking-- and things like muscle developement etc are on the improvement side... i heard she had some surgery postponed like hunter becuse of her activity with the dog... hunter has had 2 surgeries put off now- because he is walking with the dog-- in a more normal fashion than "lift and place" with a walker. WHATEVER THE CAUSE-- SOMEHOW WE NEED TO PULL THAT WIRE-- WHILE PULLING IN ANOTHER?? BUD SAID HE WOULD BE HERE FOR A FEW MINUTES TODAY--( HE IS ABOUT TO GO SKIMOBILING IN UPPER VERMONT) ANBD JOYCE SAID SHE WOULD STOP BY TO THINK ABOUT THE PROBLEM ON HER WAY TO AND FROM BOSTON-- SH EWORKS FOR A COMPANY THAT USES WORDS I DO NOT UNDERSTAND-- PULLING WIRES UNDERGROUND MAY BE NEW TO HER-- UNDERGROUND PIPES IS MORE MY TYPE JOB---BUT IF WE GET THEM LANDED SHE MIGHT KNOW WHAT TO DO WITH THEM. I DID THAT BIT ONCE BEFORE WITH 8 TEENY TINY WIRES AND A OVERSIZED PHONE PLUG THING... BETWEEN SHAKEY HANDS AND FAILING EYESIGHT, THERE IS NOT ENOUGH MONEY AROUND TO FEED THE SWEAR BEAR FOR ME TO ATTEMPT IT.. BESIDES... ISN'T ONE OF OUR DOGS WITH A "VERIZON MAN"? WHO HAS THE CRIMPING TOOL NEEDED TO PUT AN END TO A WIRE LIKE THAT. BEFORE I ADDRESS THE WIRE PULLING I NEED TO GO FIND MORE FUSES IN THE CONTRACTOR'S ELECTRICAL STORE...I HAVE THE BLOWN FUSE TAPED TO A CARDBOARD... THEY LOVE ME THERE... THE LITTLE OLD LADY WHO KNOWS WHAT SHE NEEDS BUT NEVER KNOWS THE NAME OF IT.-- AND WHO HAS A REALLLLLLY BIG DOG WHO KEEPS EVERYONE SERIOUS. ALONG WITH JESSE-- WHO SHOULD ARRIVE BEFORE NOON...A VETERAN APPLICANT WHO HAS BEEN ON THE BOOKS FOR A LONG TIME- AND WE NEED TO LOOK HIM OVER AGAIN AND SEE WHO MIGHT BE IN OUR "STABLE" OF DOG CHARACTERS. AND... BIG EXCITEMETN-- THE CRANEY COMPANY HAS LANDED WITH THE INTENTION OF INSTALLING THE UPSTAIRS BATHROOM IN THE TRAINNING ROOM.. HE CALLED ME OVER TO SEE WHAT THE PLANS WERE FOR WHAT WENT WHERE.. PLANS???? I CAN NOT IMAGINE WHO WOULD BE CONCERNED ABOUT WHAT WENT WHERE-- HE WAS RELIEVED TO HAVE ME SAY GET THEM WORKING ANYWAY THAT IS EASIEST -- THE ONLY COMMENT I HAD WAS-- DON'T HOOK THE UPSTAIRS SHOWER TO THE PLUMBING OF THE DOWNSTAIRS SHOWER- BECAUSE WE SEEM TO HAVE DISCONNECTED THE DOWNSTAIRS SHOWER WITH ANYTHING THAT WOUEL RESEMBLE EVEN A DRYWELL ..
30 YEARS AGO WHEN WE BUILT THIS HOUSE, THE ELECTRITIAN GUY WAS A DRINKER SO WE HAVE SWITCHES INTHE UPSTAIRS BATHROOM THAT CONTROL TH E OUTSIDE FLOODLIGHTS--- AND HE HOOKED 220 TO THE 110 CIRCUIT AND WE BLEW UP A DISHWASHER AND BLAMED THE DISHWASHER UNTIL WE BLEW UP THE DISPOSAL TOO. LET ME REPHRASE THAT--- I HAVE BEEN TRAINED NOT TO EXPECT THE NORMAL... WHATEVER THAT IS. i reaqlly meant to figure out the font stuff ---maybe today-- and not everybody has this problem of each sentence is a straight line..
david 1 tackled the problem with the puppy hill camera-- the 24 volt transformer smelled funny.. now that is my type of electrical analysis ... how does it smell? something about permutations and combinations of 5 things--- it was a while... but (n-1)factorial ? maybe? during all the bombing in the war the british did not have much-- so i think they all sat around and found out how to entertain each other with language. because when i got there in 1957 i wass faced with going to college parties where people sat around and talked-- no drinking, no tv, no games....they just talked-- and it was very amusing...- and they did things like decide to have a party on "arthur's seat" which is a sizeable hill outside edinburgh that looks like a crouched lion in many photo's. arthur's seat is big enough to involve heavy duty uphill walking if not climbing-- from several different angles. i remember one night someone said there was to be a party on arthurs seat at 2am-- and about 20 people showed up-- there was no artificial means of amusement.. just conversation... and it was really funny. in this country??? never ! at least at colby college , never ! it is not surprizing to me that the author of all the harry potter books was so successful writing those books in a coffee shop in edinburgh. the creativity of her books had a similarity to the daily conversations i had when there.. many times just plain off the beat. you listened to every word and took it all apart if possible..my american english provided them with alot of fodder. it sounds impressive to say i was a member of the edinburgh university physics society-- when in actual fact i was more or less the mascott.. no way could i keep up with them intelectually-- they got out of highschool with the equivalent of our college education-- and then they went to college. i may have this slightly screwed but one of the members of the phys soc named tony-- was made sir tony because of his work designing the scheduling of trains, engineers, timetables,airplanes, pilots, equipment.. the basic program for which was still being used fairly reciently. another tony story--- he had a car which - for as long as i knew it never had a working engine-- we pushed it all over edinburgh--- met alot of interesting people who would stop by to help on the uphills..
so stand by for corrections..
luckily there is cut and paste.. I wanted to share with you an experience that Stanley and I recently had that highlights the stellar training that you and Megan and others at the farm perform that brings the gift of stability to so many of us that suffer from mobility issues. I really feel that I cannot begin to thank you enough for providing for these amazing animals and us, the recipients. I recently went for a walk through my neighborhood with Stanley. We crested a hill and had started down when I heard someone yell a name sharply. I immediately started looking for where the threat would be coming from hoping to evade whatever would be coming at us. A man was in his front yard with a dog a few hundred feet ahead and to the the right of us. The man did not have his dog on leash and it was running for us Stanley and I. I had nothing with which to protect Stanley and myself with and attempted blocking the oncoming dog by stepping in front of Stanley. This did not work. The other dog darted around me and I realized I wouldn't be able to continue shielding Stanley with my body before the owner of the other dog would get to us. I literally had a split second to make a decision andI let go of Stanley's leash and yelled for him to go. Stanley ran, not a hard decision since the other dog was now jumping at his throat. Stanley was able to keep ahead of the other dog but was slowed down by his desire not to look at the dog chasing him, but back to me to make sure I was okay. Every time he did this the dog was snarling on his backside. I kept yelling for him to, "GO, RUN STANLEY, GOOOO!!!" I could tell when he was going to look back at me because the muscles in his neck would start to move before his head came around (no different than knowing which direction your opponent on a field is going by watching his hips), this I could see from a distance. By calling out for him to go and run before he turned he was able to stay ahead of the other dog. I couldn't run but I moved as quickly a I could in the direction they were headed. It was agonizing. The man was running and calling for his dog. Finally the dog reached a point where he seemed uncomfortable to pass and hesitated long enough that the owner was able to grab his caller. The man kept repeating how sorry he was as I continued limping down the road towards Stanley. With the dog no longer chasing him Stanley stood still and I called for him to come. He was shaking and looking behind me at the other dog and didn't move. It was dusk, I live in a residential neighborhood and was concerned about the traffic that picks up as people come home at this time of the evening. Stanley could be startled by a car and run or be hurt. I had another split second decision to make and I realized Stanley's concern for me would trump everything else so I did the only thing I could think of. I fell. The second I started falling over, fear left his face and it was replaced by concern. You know those eyebrows, how they pucker into a worried frown. He dashed towards me and slip sideways into a brace position. He turned his head to look at me as if to say, "here I am, get up, you're okay!" I pulled myself up the way you taught me, laughing and crying with relief. We walked home as a pair. My heart is full every time I think of this. Thank you. Thank you for your inspiration, your dedication to animal and human alike. Please extend my thanks to everyone else who helps out on the farm. big prayer of the day----- BELL AND GEORGE GO TO SCHOOL ALONE TODAY--- MEGAN GOT THEM ALL CHIPPED ( GEORGE NOT BELL) AND CERTIFICATED ( THAT'S A WORD?) BELLA'S MOM SIGNED THE OWNER'S AGREEMENT SAYING THEY WOULD BEHAVE-- AND AFTER EVERYONE TOLD GEORGE TO BEHAVE AS TEHY WENT OUT THE DOOR, I TOLD BELLA TO BEHAVE TOO. GRANTED IF I WAS DESIGNING THE SYSTEM I MIGHT DO IT DIFFERENTLY---- IT MIGHT BE NICE IF THE STUDENTS WERE RESPONSIBLE FOR MOVING FURNATURE OR HELPING WITH HER LUNCH TRAY.. YOU KNOW THE HELPFUL TYPE STUFF THEY SHOULD LEARN-- AND SAVE TAX MONEY....I CAN HEAR THE PARENTS "WHY SHOULD MY CHILD CARRY A TRAY FOR SOMEONE ELSE?" I WOULD TELL THEM "SO THE KID DOESN'T TURN OUT TO BE AN SOB LIKE YOU"
THIS IS WHY IT IS BETTER FOR MEGAN TO HANDLE THE SITUATION. I GET MAD.... I WAS TOLD AS A CHILD ONLY DOGS GO MAD ,PEOPLE GET ANGRY. I HAVE BEEN AROUND DOGS A LONG TIME... I GET MAD. AND THEN THERE IS THIS FORMAT OF THEIS EMAIL-- I AM TOLD-- AND HAVE SEEN IT -- WHERE THE SENTANCES CONTINUE STRAIGHT FOR A BLOCK AND A HALF WITHOUT FLIPPING TO ANOTHER LINE..I DON'T KNOW WHY-- THAT WOUDL BE A GOOD PROJECT FOR THE DAY.. YESTERDAY'S EXCITEMENT WAS A NEIGHBOR'S 9 YEAR OLD KID SHOWED ME HOW TO MAKE MY PHONE TELL ME THE NUMBER OF THE PERSON I WAS CALLING.. FOR A VERY LONG TIME I HAVE BEEN MISSING THE LAST 4 DIGITS-- MAKING FOR SOME SURP[RIZING CONVERSATIONS. WHY WHEN I CALL TIM TO FIX THE CAMERAS, HE IS LOOKING AT ME THRIU THE PHONE... I DO NOT KNOW. IT IS LIKE MY PHONE IS A PEEPING TOM---I NEVER KNOW WHEN IT IS BEING A CAMERA TOO. MY PHONE WITH THE ROTARY DIAL WOULD NEVER DO THAT. AND THEN THERE IS THE PUPPY HILL CAMERA-- BEEN DOWN -- WE HAVE PUSHED AND PLUGGED TIL TIM DECIDED HE WAS 99% SURE IT WAS BLACK BOX #437 AND IS FEDEXING A NEW ONE TO US FOR TIDAY. Becky was very hesitant to speak with me since she had not been notified that someone would be calling. She was very pleasant about it but suggested a group email would be an easy way to communicate such things. I told her SDP does not have a consolidated email list but that it was a good idea. I told her I would be happy to have someone email or call her to confirm I was who I said I was or she could quiz me about things around the farm. What color is the barn was her question and both laughing, she let me proceed. I know I’ve mentioned it before, but after last night’s wonderful celebration, I feel I need to mention it again. Because I regularly volunteer at Service Dog Project (SDP) where Denim is from, I was invited to last night’s celebration and met many other people that give so much to this wonderful organization. In the summer of 1998, I was diagnosed with Ataxia. Being a progressive condition, it has got more invasive over the years. In June of 2013, our family pet dog of 12 years passed away. I (along with the rest of the family)was devastated and could not bear to not have a dog around. I was lost. Who would be my side when the kids were at school and my husband at work? Per the suggestion of my husband and the encouragement of my neurologist, I looked into service dogs. In my search for a mobility dog, all fingers kept pointing to SDP. “But they only deal with Great Danes and I’m only 5’2”!” Well, in January of 2014, I called Carlene White, the founder of SDP. She insisted the size was not an issue and had me visit the farm in Ipswich. Well by April I was home with my Denim by my side. She is absolutely wonderful and has made such a change in my life. Up to now, I’ve been able to avoid the wheelchair and hopefully I will be able to continue walking with Denim by my side for several more years. This video shows me learning how to do stairs with her. Well, after last night’s party, I realized that this whole experience has benefited me even more than I had thought. Because Denim worked so well for me, I wanted to give back to her too. So we started visiting the farm on a fairly regular basis so that Denim could run free and be a dog. Because I visited the farm regularly, I started noticing how it worked and because I wanted to give back to an organization that had given me so much, I started volunteering there. Another benefit of my Ataxia? For more information about the organization, check out their website:http://www.servicedogproject.org/ or come visit on a Sunday afternoon for open house. IF MATTER MAY NEITHER BE CREATED OR DESTROYED HOW CAN 1/2 CU P OF M&M MAKE ME GAIN A POUND. FORTUNATELY IT IS NOW EMPTY--- NOT THAT WE SHOULD FILL IT... BUT MAYBE MOVE IT TO THE LAUNDRY ROOM. CHAOS.....YESTERDAY EARLENE CALLED AND SAID SHE WOULD BE HERE IN 5 MINUTES-- GIVING ME A A CHANCE TO PUT CHAOS ON CAMERA FROM SOUND ASLEEP, BORED ---TO TELLING HER "PAUL'S COMING"( PAUL IS CHAOS NAME FOR EARLENE) AND SEEING HER JUMP UP AND GO TO THE WINDOW TO WAQTCH FOR HER CAR-- GET ALL EXCITED WHEN SHE ARRIVED AND RUN TO TH E FRONT DOOR... I HOPE SOMNE ONE TAped it-- IT IS QUITE SPECTACULAR. THEY WENT FOR A LONG WALK- AND THEN TOOK HER HOME FOR OVERNIGHT. SHOULD BE BACK TODAY. YOU WOULDN'T THINK........ START WITH FACT 1... I HAD 8 CURLERS AND NOW HAVE 4. EVEN IF "THERE IS MANY A SLIP TWIXT CUP AND LIP...."
THEY GO FROM MY DRAWER TO MY HEAD TO MY DRAWER- SO IT IS A SHORT CIRCLE-- ALL 8 AT ONCE... WHY AM I MISSING 4? -- SINCE I WASHED THE DRAWER OUT WITH ANNESETTE LIQUOR, WE HAVE NOT HEARD MUCH FROM HER. I THOUGFHT FOR SURE SHE WAS BACK WHEN WE NOTICED A VERY WIERD SMELL EVERY NIGHT AT MAIL CALL-- TIL WE DISCOVERED THE DRY EARASE MARKERS WER THAT SOURCE OF THAT STRANGE SMELL. ON THE TOPIC OF ODORS.... I HAVE SEEN -- ON THE INTERNET-- SO IT MUST BE TRUE-- THAT THE GAS PRODUCED BY DOGS WILL PREVENT CANCER. SO WE ARE ALL SET AROUND HERE. BUD---DID A WONDERFUL THING YESTERDAY HE TRIED TO USE THE COMPRESSOR AND IT DIED-- SO BUD, BEING BUD AND ELECTRICALLY INCLINED, TOOK IT APART IN THE ALLEY OF THE DOG KENNEL ( HEATED AREA) AND PICKED... AND PICKED... AND PICKED ENOUGH "STUFFING " OUT OF IT TO 1/2 FILL A 5 GAL BUCKET--- PROBABLY MICE BECAUSE OF THE SIZE HOLE THEY CHEWED TO GET INTO THE COMPRESSOR. THE PROBLEM WAS CLEARLY WELL BELOW BUD'S LEVEL OF ELECTRICAL EDUCATION... WHAT HIS EDUCATION DID WAS TO GIVE HIM THE COURAGE TO START. THAT WAS ONE OF THE INTELLECTUAL CONVERSATIONS THAT GOT GOING AROUND THE COFFEE POT YESTERDAY.. IS COLLEGE WORTH THE COST? I AM NOT SURE... FOR A COUPLE REASONS. I WAS WELL PAID BY A COMPANY FOR 19 YEARS BEFORE THEY FOUND OUT I HAD A COLLEGE DEGREE. THEN I AM AFRAID HAVING A COLLEGE DEGREE IS INCLINED TO ENCOURAGE A PERSON TO THINK CERTAIN JOBS ARE BENEATH THEM. IT HAS NOT BEEN SAID ON THE INTERNET OFTEN ENOUGH- THAT "A VERY EFFICIENT MOTHER OFTEN MAKES FOR A KID WHO IS INCAPABLE OF MUCH. " FOR A WHILE AROUND HERE I HAD JUGGLING BALLS- AND WOULD SAY TO KIDS IF YOU HAVE NOTHING TO DO TRY LEARNING TO JUGGLE. SOME DID-- SOME DID NOT EVEN TRY... TRYING WAS THE CRITICAL PART. "Bella and George want to say thank you to everyone at SDP and all the CPs. They are officially a team! We are so excited to have George in our family and to see how he helps Bella grow. We thank all of you for your support because if it wasn't for all of you this would have never happened. We can't thank you all enough for your love and support to SDP and to Bella and George. We will never forget all our great CP and SDP family for all they have done. We love you all and thank you sooo much. If you haven't had a chance to get your chicken bricks please do so for Bella and George! We can't thank you all enough. Love The Burtons!" Hi, It's Brenda and Dolly stopping by to let you know how things are going. The last 6 weeks have been a difficult time for our family. My Mom became very ill and in three short weeks passed away. During that time Dolly was a champ, she was amazing!! It was quite a distance to walk from the parking lot to her room. I would not have been able to do it without Dolly's help. A year ago i had an aunt that was in the same area of the hospital and had to use a wheel chair to visit with her. Now that I have Dolly I was able to do it dependently! That is a great feeling. Dolly had her own spot in Mom's room where the nurses had a very nice makeshift bed for Dolly, with many many layers of nice blankets. She even had her own wash basin for fresh water and several things to occupy her time. She was such a good girl. She became a celebrity with people stopping by just to see her. Sometimes as we were walking down the hallways we would overhear the nurses and sometimes doctors saying," There's the dog !!" They loved having her there, they said it changed the atmosphere and they enjoyed it. Thanks again for "Everything" that "Everyone" does to make it possible for me and others to have the freedom and independence to be able to do the things we want and like to do, but also for the things that we "Need" to do. Like help take care of an ailing parent in their final journey in life. Without Dolly i would never have been able to spend the time with her that I did. It was because of the independence that Dolly has given to me that I can feel at peace that we (Dolly and I ) did all that was possible for Mom. I am forever grateful for that, so thank you so much! !